Library policies and procedures relating to collections and services. 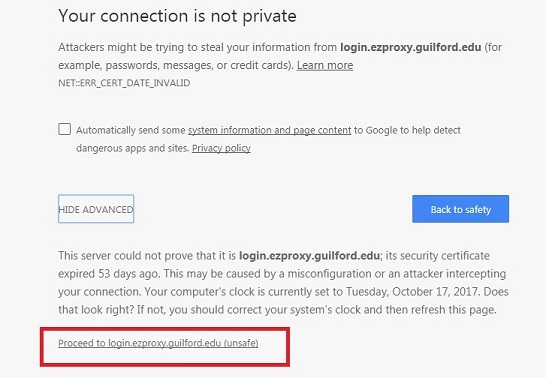 Current Guilford College students, faculty, and staff can access nearly all of the library's databases and electronic resources from off campus through the library's proxy server. Use the links on the library's databases and electronic resources page http://library.guilford.edu/c.php?g=111676&p=722971 to connect to electronic resources. Please note that product and vendor-specific URLs (e.g. www.jstor.org) and bookmarks that use them usually won't work off campus. You'll need to use the links on the library's webpage to access. 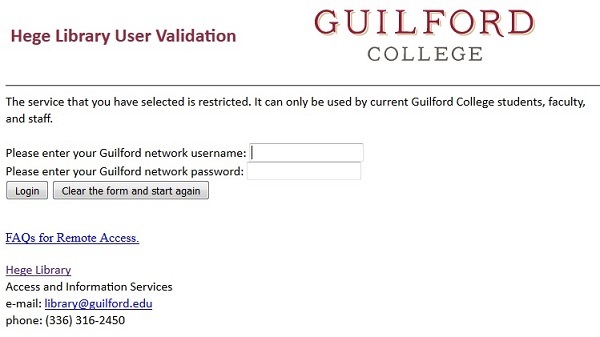 After you click on a database link from a library webpage, you'll be prompted to enter your Guilford network username and password. 3. Once you've logged in and been authenticated, you'll be taken directly to the database. 4. If you have any issues logging in, please contact the library. If you need to reset your password please contact the IT&S Help Desk. 1. Help! 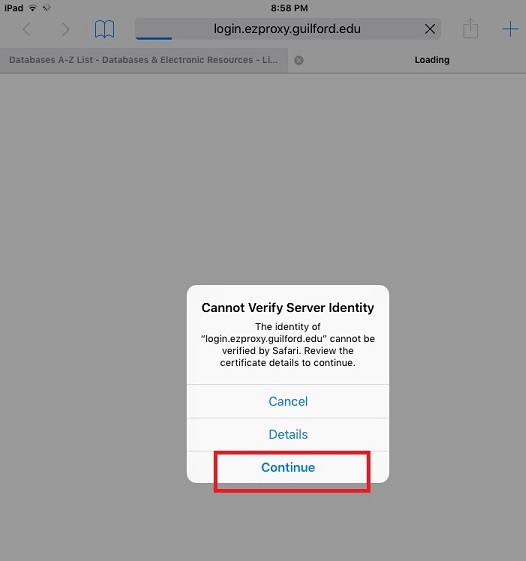 When I click on the link it says server cannot verify server identity. In Chrome click on advanced and then proceed to resource. 2. Help! When I'm on my tablet and try to login it keeps clearing my information and refreshing the screen! The buttons for login and reset this form are very close together. Please try zooming in our your tablet screen to make sure you aren't accidentally clicking on reset. 3. Help! I'm logged into the VPN client and can't access any databases. Please log out of the VPN client and try again. 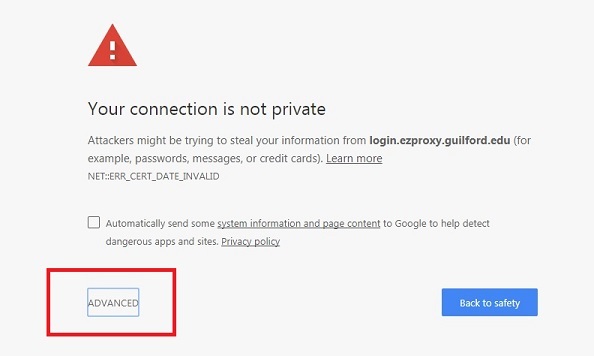 You'll need to be completely disconnected from the VPN in order for the proxy server to recognize your login credentials.